resource for scholars of Middle Eastern Studies. In the ancient Iran (Persia), there was a special name for every day of the month. Today's Zoroastrians, continue to use the same names and the same calendar as their ancestors. These names represented the various Guardians that protected and helped people. Many of the names were nature-based and dealt with the elements; while others dealt with the world beyond and the powered structure. Clearly one can see the harmony and the complex relationships that existed between humans and their known and unknown worlds. The names below represent the key ideals of this ancient civilization, compare these ideals with those of t he American notions of democracy, justice, equality, individual human dignity, liberty, rule of law and progress. Oormazd = Ahooraa Mazdaa = The Life Giving-Great Wise One. Names of the first five chapters of Zoroaster's songs are listed below. His songs are known as Gaathaa or Gatha. These five names were used to make up the missing five days of a 365-days calendar. Since the Zoroastrian Calendar has 12 months of 30 days each, at the end of the last month of the year, these names are added to make up the missing five days. 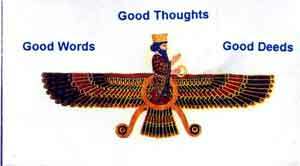 Ahnavad = This chapter is about God, Zoroaster becoming a prophet and freedom to choose one's religion. Oshtavad = This chapter is about secrets of creation, and getting to know one-self and God. Sepentamad = This chapter is about creation, choice, and victory of good. Vahoo Khashatra = This chapter is about renewing the world and the human role. Vaheesh-too-esht= This chapter is about Zoroaster's wish. Once every four years, a day is added to this seasonal calendar to take care of the leap year situating. The name used for the 366 day is Oordaad, meaning "Extra Day Given by God." This Extra day is also known as Panjeh or Behizak. It is interesting t note that when the names of the month and day coincided, that day was celebrated. The purpose of these feasts were to redistribute wealth, make sure every person was taken care of, and was enjoying life. It also marked the beginning or ending of a harvest season and giving thanks to Ahuraa Mazdaa. Today's Zoroastrians continue this tradition.